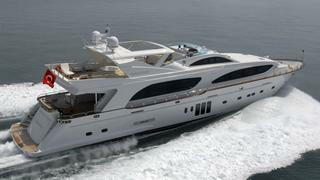 Axel Douqué of Ocean Independence tells me he's sold 33m motor yacht D'Angleterre with Yacht Marine bringing the buyer. Built in cold-moulded mahogany by Turkey’s Bilgin Yachts in 2008 to a design by Kerim Denir, D'Angleterre is a RINA-classed motor yacht. She accommodates 12 guests in a master suite, VIP, two double and two twin cabins, and has a large flybridge with a sunroof, spa pool, bar, fridge, dining table and sun loungers. Twin 1,825hp Caterpillar engines give her a cruising speed of 17 knots and a range of 400 nautical miles.